Ernest Hogan (his real name was Reuben Crowders) was a native of Bowling Green, Kentucky. His first big hit was the first of a new genre of music, which he coined “ragtime”, in 1895. Scott Joplin was quick to pick up the ragtime style in his 1898 composition, Maple Leaf Rag. 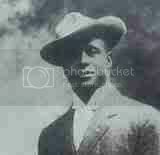 However, it was Ernest Hogan who went on to become the world’s most popular black entertainer of his time. He was the first black entertainer to produce (and star in) a New York Broadway show, The Oyster Man, in 1909.